Reenlisted as a 2nd Lieutenant. 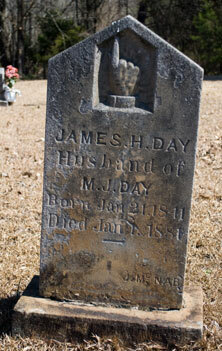 2nd Lt. James H. Day was the son of Richard Day and Elizabeth Penn, the grandson of David Day, Jr. and Stephen Penn. At the time of enlistment into the 1st Alabama Cavalry, US on July 21, 1862, he was 21 years old, 6' 1" tall with light complexion, blue eyes, and sandy hair. He was appointed 4th Sgt. upon organization of the original infantry company, and held rank of sergeant until October 12, 1863 when he was commissioned 2nd Lt. at Camp Davies, MS. He had a brother, Richard B Day, and a nephew, George W Day, in the 1st Alabama Cavalry. On November 1, 1864, 21 men of his company were selected as personal escorts to General Sherman. He took command of the company's remaining 24 men. On March 10, 1865, he was given command of Company K, after its leader was killed in action in North Carolina. He returned to his company in May and was mustered out with his unit July 19, 1865. After he mustered out of service, he returned to his home community, married Martha Simpson and had four children. His first born, George Spencer Day, was named after Colonel Spencer, commander of the 1st Alabama Cavalry. James died 1 January 1881 at the age of 40.